Mike Leigh's latest film arrives painted on a far greater canvas than he's previously attempted in his illustrious career. While you can still expect the intimate domestic exchanges and exquisite detail that he is known for, the backdrop is a real historical event: the 1819 massacre at St Peter's Field in Manchester, when a peaceful pro-democracy protest was overrun by military forces, leaving at least 15 dead and hundreds injured. Leigh begins on the battlefields at Waterloo, which, of course, gave the film's central tragedy its nickname. With young bugler Joseph (David Moorst) surrounded by carnage, it sets the tone for what will be – on Leigh's own terms – an epic. The shell-shocked soldier soon returns to the bosom of his family, with his mother Nellie played by the great Maxine Peake, an actress who feels like she's been working with Leigh her whole life. Set during a time of political upheaval, when parliament refused to grant the vote to the working classes, Leigh crafts an ensemble story that follows various parties until they coalesce in Manchester. Magistrates, reformers, even the mildly buffoonish Prince Regent (Tim McInnerny) form part of this tapestry. 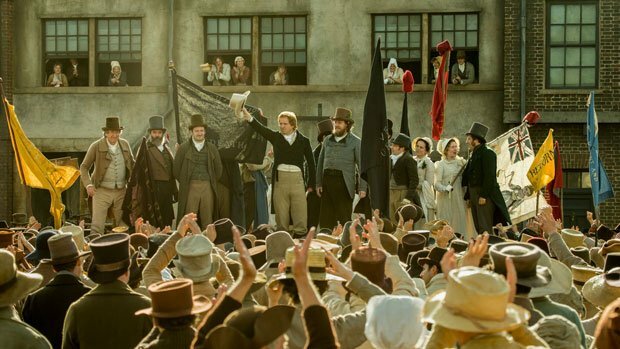 Like Ken Loach's Land and Freedom before it, Peterloo shows what it takes to achieve change, epitomised by the excellent Rory Kinnear as radical orator Henry Hunt. With so many disparate characters, Peterloo struggles at times to gel and lacks a focal point, unlike its sublime predecessor Mr Turner. But there can be no denying the passion behind the film, or the craftsmanship of the costumes, design and photography that bring 19th century England so vividly to life. As powerful as the final scenes are – and Leigh really shows he can handle big-scale action – it's the film's quieter moments that linger. Screening on Wed 17 and Fri 19 Oct as part of the BFI London Film Festival 2018. General release from Fri 2 Nov.